The continuing surplus of equipment up in Chubut province resulted in the line being laid to 75cm. gauge, and spare locos and stock were also shipped down from Puerto Madryn. Eight Henschel 2-8-2s were sent south, along with one Henschel 0-6-0T (No. 19455), and one Henschel crane tank. The tank engines were used during the construction work, and the 0-6-0T was probably used for shunting. The crane tank may have fallen into disuse once the line was complete, but it survives minus its crane; this might mean that it was converted into a conventional shunter after the construction work was complete. One of the 1922 built Henschel 2-8-2s is seen in charge of a train of four-wheeled side-discharge hoppers during the construction works. The chopper coupling fitted to enable coupling to the ex Puerto Belgrano wagons can be clearly seen, as can the board fitted at the rear of the tender to enable coal to be piled high on top of the water tank. One of the Henschel 2-8-2s hauls the ceremonial passenger train at the opening of the line (1). The train is made up of two coaches and a 'furgon' van from the 1922 Familleureux stockpile, preceded by a 1922 'plataforma' wagon on which two small water tanks from the four-wheeled wagons have been mounted. The bridge is clearly a temporary structure. The 2-8-2s comprised nos. 118, 119, 122, 123, 124, 127, 129, and 130 (2). Although 29 years old by then it is likely that they had never seen use until arriving at Río Gallegos. They were to run on coal on the Río Turbio line of course, which may only have required new firebars in the grates but which would certainly have needed some modification to the wood-burning type tenders, as mentioned elsewhere. Even from the start they were under-powered for the new coal trains. There are reports that they were used double- and even triple-headed, and it seems likely that the derelict loop and signal box at Km.245 indicate where bankers were provided to assist west-bound trains up to la Dorotea. Given that here were only eight locos, it is clear that only one train per day each way - carrying just 96 tonnes to the coast - could be run, far below what was needed. As early as the mid-50s the line's engineer Señor Cappa was suggesting that the locos be replaced by 250hp diesels which could work in multiple (3). 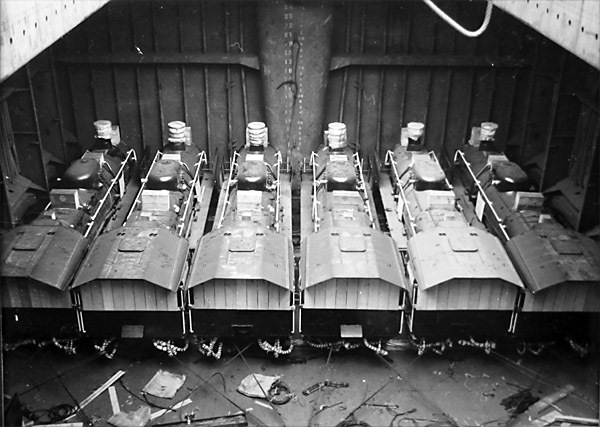 This did not occur but by 1956 the first batch of new 2-10-2s had arrived and the Henschels were side-lined. Two, nos. 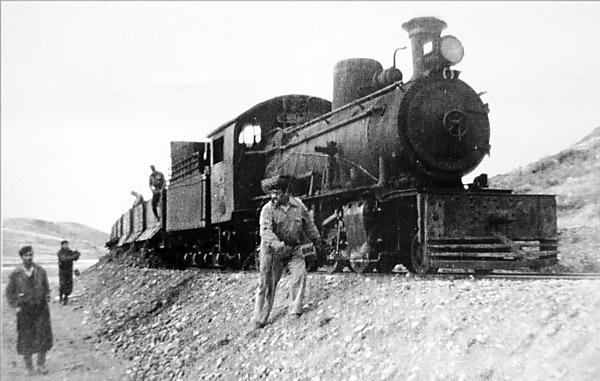 118 and 119, seem to have been retained until the mid-1960s to work the workmen's passenger train between La Dorotea and the mines. 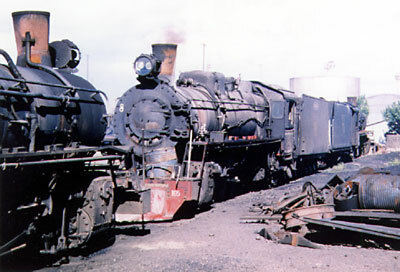 Four of the 2-8-2s ignominiosly ended their lives lying dismantled at the YCF depot at Dock Sud in Buenos Aires; however, even in the 1970s another three of them were still lying derelict at Palermo Aike (4). In addition, one of those listed above, no. 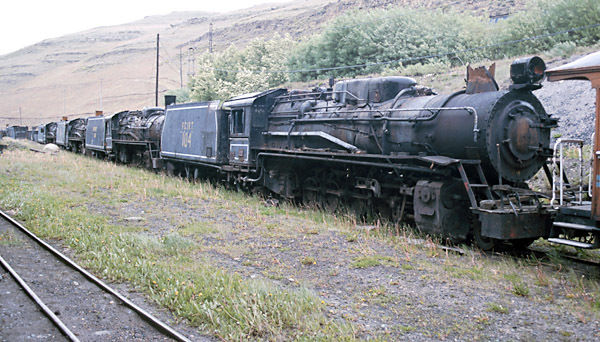 119, had returned to El Maitén works on the Esquel line by 1975, with its firebars still in place (5). 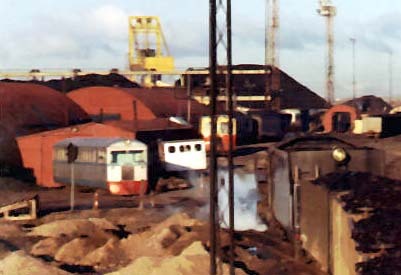 A couple of Henschel boilers also lay at Río Gallegos shed at the same date. A photo taken by N. Dudley and reproduced in The Narrow Gauge issue no 82 (6), shows a surviving Henschel hauling a mineworkers' passenger train at Rio Turbio on 29th October 1965. 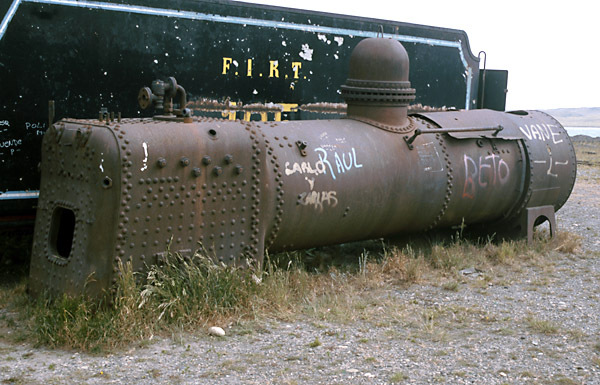 The last Henschel boiler was still lying at Río Gallegos in December 2000, though soon to be cleared away. It is seen here dwarfed by the tender of one of its successors, though that too is now derelict. The boiler's non-standard smokebox supporting bracket suggests that it had been used as a stationary boiler for the works. Both of the tank engines have survived, somewhat surprisingly, although only as derelict shells. 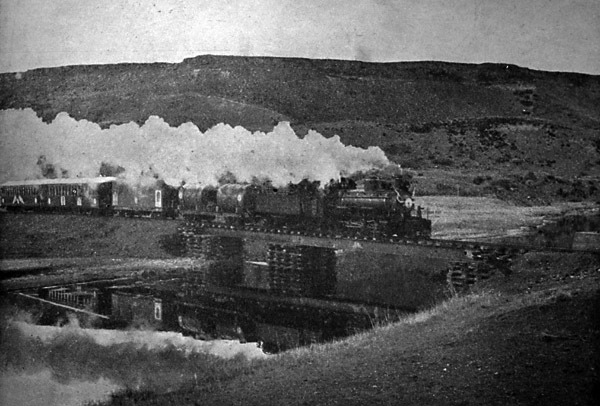 The 0-6-0T, having spent most of its life at Río Gallegos, is now 'preserved' at Río Turbio, whilst the craneless 0-8-0T lay in a Río Gallegos park when seen below. Above is Henschel 0-8-0CT no. 19457. It sat for some years in the Río Gallegos Museum outdoor exhibits section near the big roundabout on the south side of town. More recently it has joined 2-10-2 no. 117 (actually no. ???) in the ferro-aficionados compound near the old loco shed. Its crane has long since disappeared, which may mean it saw service as a conventional shunter after the line had been completed. Henschel 0-6-0T no. 19455 lay at Río Gallegos in the 1970s still almost complete. However at some point it has been shifted to the mine museum at Río Turbio and its boiler has been replaced by a simple steel drum - with no chimney. Apparently the original boiler found a second use in a local school. Both locos gained extra home-made-looking rear bunkers at some point. The Henschel 2-8-2s being seriously under-powered, the railway looked around for bigger engines. The E2 series of 2-10-2 on the metre gauge General Belgrano system provided the inspiration, and a batch of ten, modified for the narrower gauge, were ordered from Mitsubishi in 1956. These were nominally of 800hp, compared to the 411hp of the earlier locos. They have twelve-wheeled tenders giving them an overall length of 18m. With a width of 2.6m. and an all-up weight of 90 tonnes, they must be the largest 75cm. gauge locos to have worked anywhere in the world. 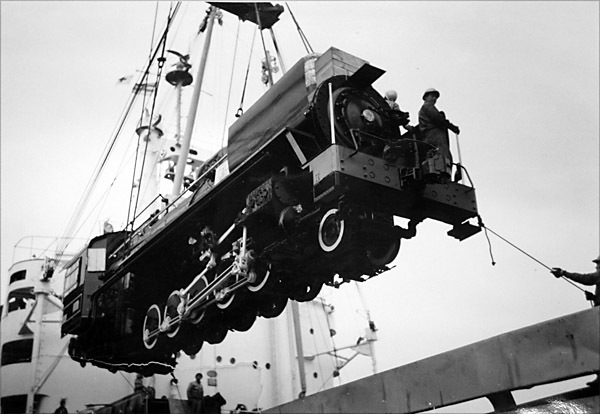 One of the first batch of 2-10-2s is seen during its journey from Japan. When first introduced they were disappointingly lacking in power, and had a tendency to throw much of their fuel out of the chimney if worked hard, whilst clinker formation on the grate soon slowed their progress. The mine had been relying on the new arrivals to permit a substantial increase in output, and clearly something had to be done. The solution was to bring a young Ing. Dante Livio Porta down to the far south, as railway manager but with the task of transforming the performance of the new engines. This he did, by a rigorous analysis of their draughting arrangements and the subsequent introduction of the gas producer combustion system (GPCS) combined with a precisely calculated 'Kylpor' (Kylala - Porta) exhaust. Much additional detail about this work - which made Señor Porta's name internationally - can be found in Martyn Bane's website. The ten locomotives were gradually rebuilt to incorporate Porta's ideas, though some sources suggest that no. 106 was left largely in original state as a comparison. The full extent of the transformation is illustrated by the rebuilt machines regularly hauling trains of up to 1700 tonnes, whilst experiments saw a single loco hauling up to 3190 tonnes with assistance on the up-grades. Other trials saw two locos, separated by a couple of wagons to reduce the loading on bridges, hauling up to 135 wagons. Whilst this is no ordinary 75cm gauge railway, these loads are unprecedented for the gauge. 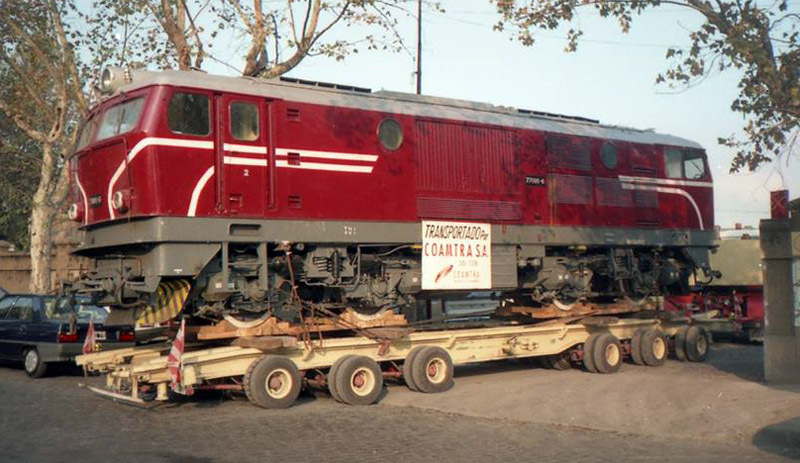 In 1964 ten more 2-10-2s arrived (111 - 120), also by Mitsubishi but with the modifications introduced by Señor Porta. They also had roller bearings on all axles. This boosted the power output to 1200hp. 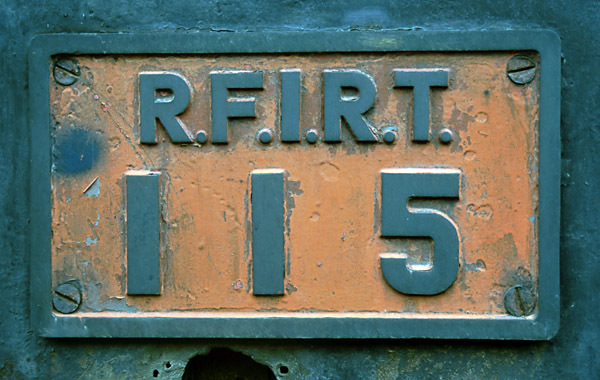 The cabside number-plate from loco no. 115. An appendix page contains a number of detail photos of parts of these engines, and Hugh Odom's 'Ultimate Steam Pages' website also includes a page of technical detail about these locos and a number of photos of individual parts. 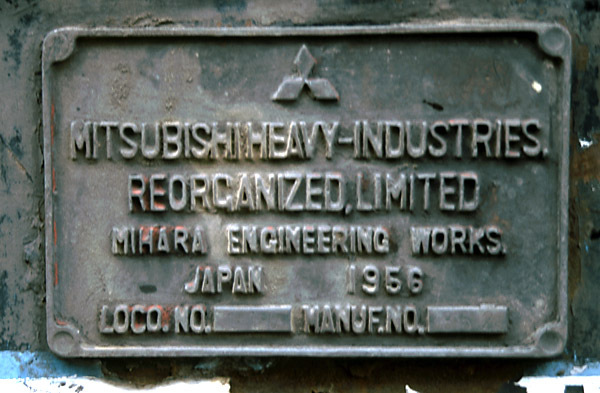 The first batch of 2-10-2s were Mitsubishi works nos. 843-852, loaded on board ship from Japan between March and June 1956. They had been ordered for the RFIEP, but the railway's change of name came whilst they were under construction. 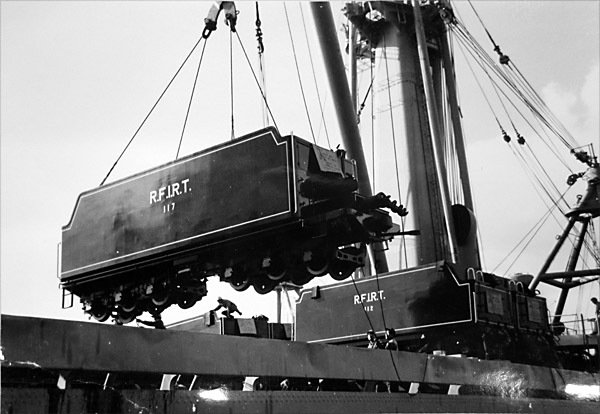 Nevertheless a works photo exists showing at least one of them with the RFIEP initials on its tender. They eventually became RFIRT 101 - 110, presumably in line with the numbering of the Henschels. The later more powerful batch were ordered in 1962. They carried works nos. 1135 to 1144 and were shipped in December 1963. They gained running numbers 111-120. The second batch of locos appear to be ready for shipment from the factory in this official photo (14). Six brand new locos on their way to Argentina (14). The tenders of locos 117 and 112 are loaded onto the ship (14). And finally one of the locos is loaded in the same way (14). In the 1980s a number of the 2-10-2s were overhauled by the Astarsa shipyard at San Fernando. A table listing details of each loco known to have worked on the railway is available in an appendix page. The 'Santa Fe's regularly covered the 160 miles in 9-10 hours with a load of up to 1700 tons. However, even bigger trains were envisaged. At one time it was thought that the annual output of the Río Turbio mines would rise towards 2.7M tonnes. Even with the modernised 2-10-2s in charge it was going to be difficult to carry all that out on a 75cm gauge railway! There were proposals for dieselization, electrification and even regauging, however, the railway's manager, Ing. 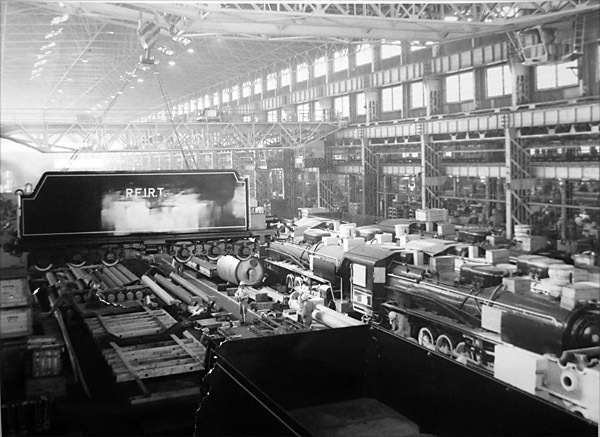 L. D. Porta, took up the challenge of designing steam locomotives that would cope. A page about Porta's work is on the 'Ultimate Steam Page' site. Outline drawings of three of his ideas have been published (7). These are illustrated below. The first is a conventional Mallet which would have been capable of hauling 5,000 ton trains. 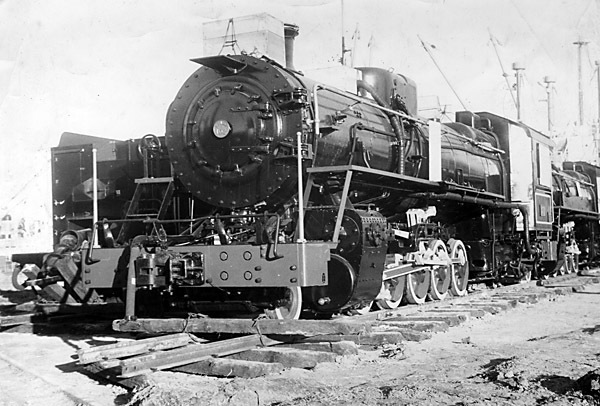 The second, a most unconventional Mallet with a front-mounted water ballast tank, and the third, a 2-12-0+0-12-2 Garratt, would have put out 4,000 HP and was intended to haul 10,000 tons! It should be emphasised that these were only outline sketches. It would be very easy to comment critically on, for example, the lack of inner pony trucks to minimise flange wear on the Garratt, or the likely behaviour of the front unit of the second Mallet when there was no water in the tank to weigh it down. No doubt further development work would have thrown up these and other points. The coal-carrying nature of the railway, and its isolation, meant that its steam locos carried on longer than on most other railways. However, the pressure towards diesel locos could not be resisted for ever. As in many other countries, the argument is not purely an economic one. It is difficult to find staff to work on dirty steam locos nowadays, and even more difficult to get spare parts. Whatever the reasons, the diesels eventually arrived, in the form of five second-hand 1000hp units from Bulgaria. These were built in 1988 in Romania by FAUR with RABA engines, though some received replacement Caterpillar engines during their overhaul by Electromac at Empalme Lobos (8). In 1996 the diesels arrived but their air brakes were not compatible with the railway's vacuum brakes and the steam engines continued in use for braking purposes. By 1997 the steam engines were out of use. At Río Turbio, complete and in near working order - nos. 104, 105, 106, 107, 108, 110, 113, 114, 115, 116, 120. At Río Gallegos, more or less dismantled - 101, 102, 103, 109, 111, 112, 118, 119. 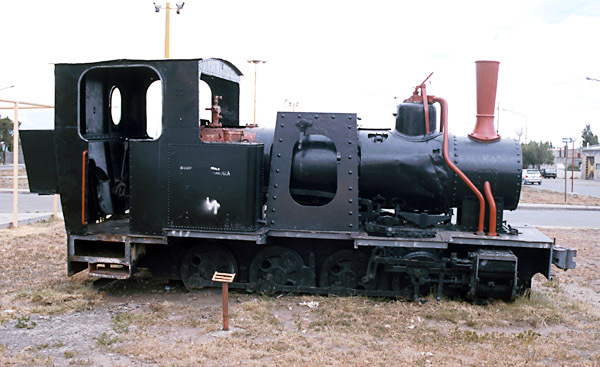 At Río Gallegos now on display - 117, restored by the Amigos del Ferrocarril. 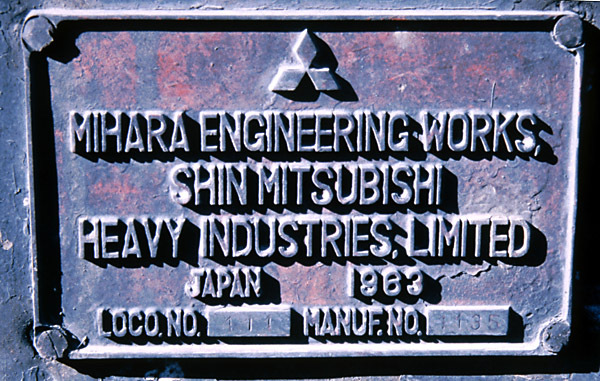 'Mitsubishi' no. 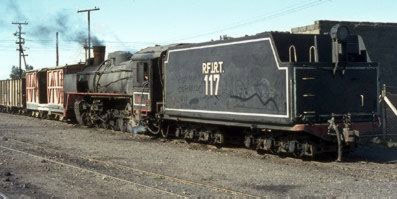 117 nears the end of its restoration at Christmas 2000. It was intended to display this loco together with two coaches down on the waterfront but in late 2011 it remains as displayed here. 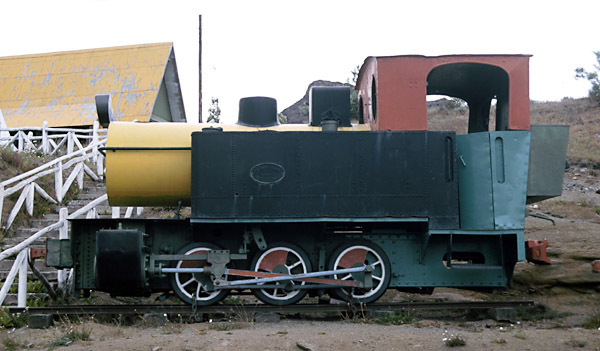 Given that the Río Gallegos engine shed was destroyed by fire, and that vandalism seems more likely there, it is good to know that the better locos are kept at Río Turbio. Occasional steam specials have indeed operated for enthusiast groups. Whilst regular steam seems unlikely over the whole 160 mile main line, the current news from Rio Turbio is encouraging. Shaun McMahon, late of the FCAF is involved in proposas to overhaul and improve a few of the locos, possibly with a tourist extension of the line across the border to Puerto Bories in mind. Martyn Bane reports in 2004 that loco no 116 is under cover at Rio Turbio and appears to be cared for and in working order. The locos had been of the BDZ's class 77, and were originally nos. 77001, 3, 4, 7 and 10 (11). The basic design originated from Henschel as class 75 (ie 75cm gauge) in the early 1970s. 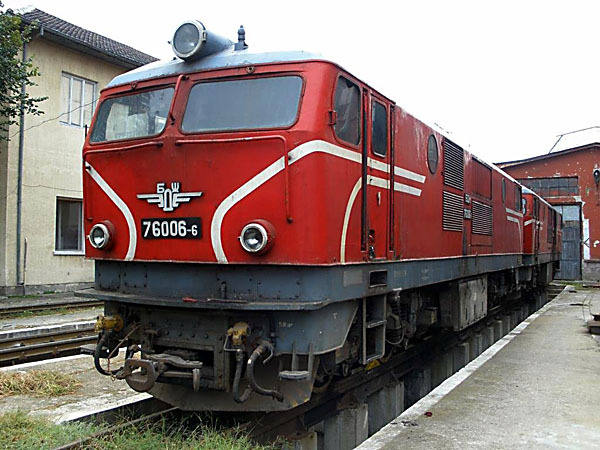 Later developments were classes 76 (of 1982) and 77 (of 1988), both built by the '23rd August works' (also known as FAUR) in Romania. 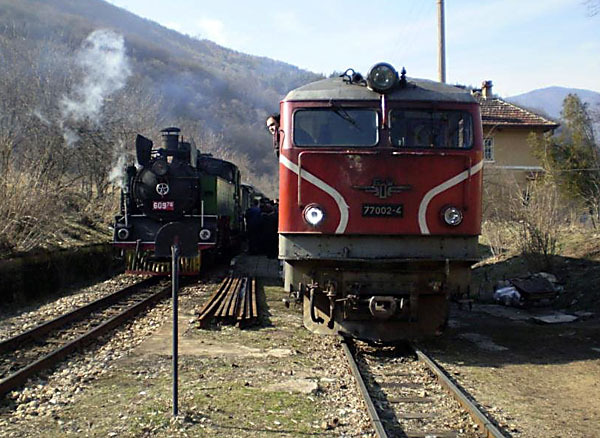 The 75s and 77s had worked on the line from Septemvri to Dobrinishte in the Rhodope mountains, whilst the 76s were built for use further north, from Cherven Bryag to Oriakhovo on the Danube. 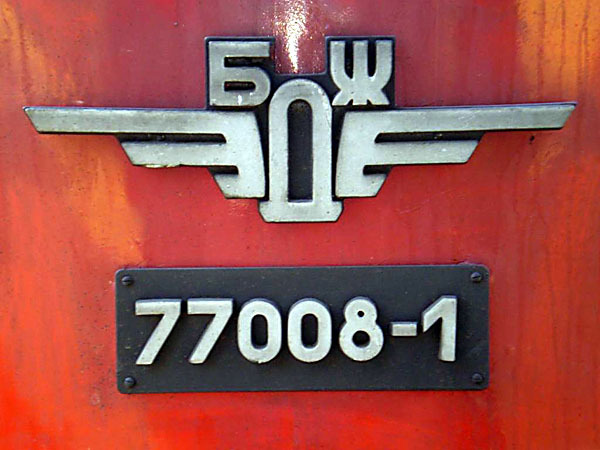 The BDZ (Balgarski Darzhavni Zheleznitsi = Bulgarian State Railways) logo and number plate on one end of a class 77. The running number in this case is 77008; the '1' on the end is a check digit, as used on many mainland European railway systems to ensure that computer systems get the number correct (11). Diesel 77002 alongside a special hauled by one of its predecessors - a 600 class 2-10-2T built by Chrzanow in Poland (11). These machines were built with RABA engines, though some received replacement Caterpillar D398B engines during their overhaul by Electromac at Empalme Lobos (8). Only four of the five ever worked from Rio Turbio, for the fifth, no. 103, was solely used as a source of spare parts. 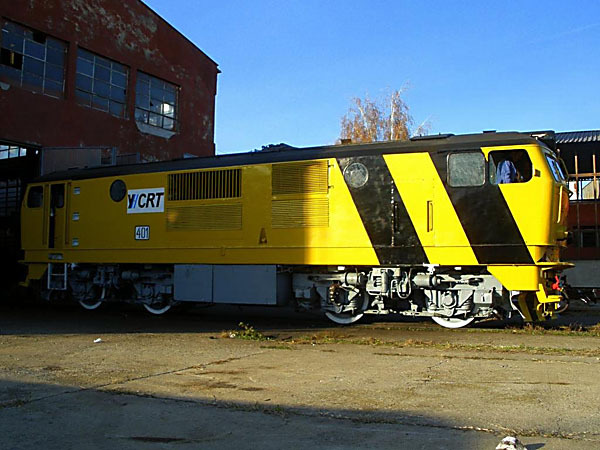 The Argentine railway e-newsletter, El Reportero Ferroviario, has reported in February 2010 (10) that the current mine operator, Yacimientos Carboníferos Río Turbio or YCRT, has purchased further diesel locos from Bulgaria. These include three mainline examples of class 76 constructed in 1982 by FAUR ('23rd August Works') in Romania, nos 76005, 6, and 12. 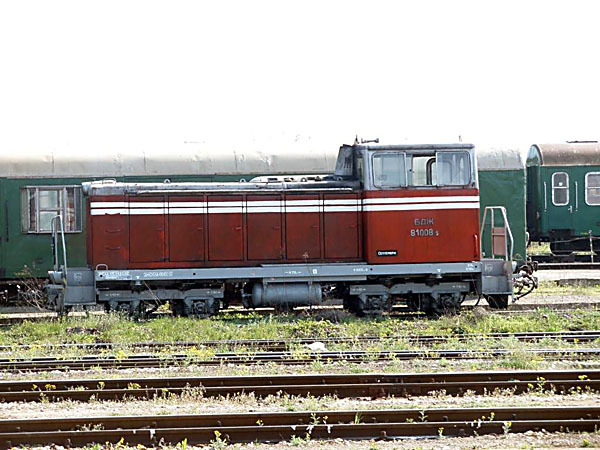 They also include one Russian-built diesel shunter of class 81, no 81005 (11). This was built by Kambarka in 1982. We are indebted to Veselin Malinov of Bulgaria for these details and for permission to reproduce a number of his photos, above and below..
Loco 76006 stands outside the works at Septemvri after having been transferred from the now closed line between Cherven Briag and Orjahovo (11). 76005 after overhaul and painting in YCRT's new livery as no. 401 (11). Class 81 shunter no. 81005, to become YCRT no. 501, after repainting in YCRT livery and before export via the port of Burgas (11). Two of the new arrivals from Bulgaria stand on flats at the dockside in Hamburg during their journey (12). 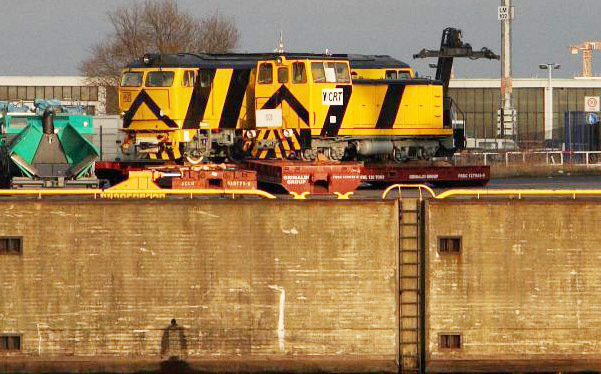 At least one further diesel arrived in Buenos Aires in 2016 and was sent for overhaul at a location unknown to us. Here it is being delivered. The view was found on Jorge Ceregliano's Facebook page. A newspaper (Tiempo Sur of 13 May 2015) reported on a meeting between officials of the mine and the Chinese firm of SRT in connection with the provision of additional motive power (8 main line and 2 yard locomotives) for the line. So far (2016) nothing further has been heard. Whilst the regular mine passenger trains at the western end of the line seem to have been abandoned in the 1960s in favour of bus services, there was a continued need to transport small numbers of railway staff to work locations. Certainly at one time the RFIRT had a 'coche motor' very similar to those illustrated in chapter seven on the FCCC. This is seen below in a poor quality JPEG image of Rio Gallegos. Later they had a number of four-wheeled railcars, of which ten had been built by Alsthom around 1960 (13). Running numbers 22 and 25 have been seen but the starting number is unknown. 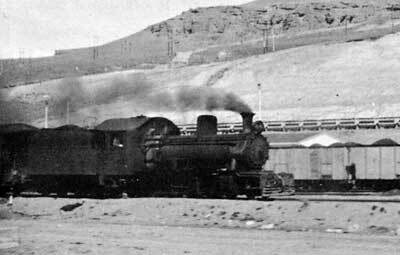 The undated photo below, from the Amigos del Ferrocarril CD (9), shows a large Puerto Madryn built railcar on the left. 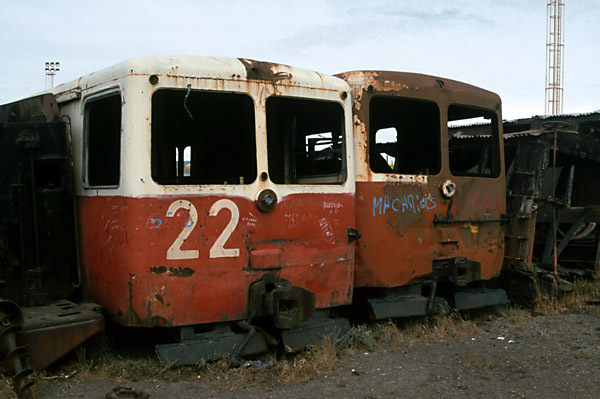 The fronts of two of the Alsthom cars lying derelict at Río Gallegos in 2000. A chassis from one of the Alsthom cars at Río Turbio in 2000. The photos below show motorised trolleys or 'zorras'. At least one of them (extreme left) is by the American Fairmont company. Attempts were made to use road vehicles mounted on a sort of home-made transporter wagon built during the 1980s and known as the 'satélite' (13). The power was latterly a Mercedes-Benz Unimog. The transporter has recently been painted-up, presumably for display. 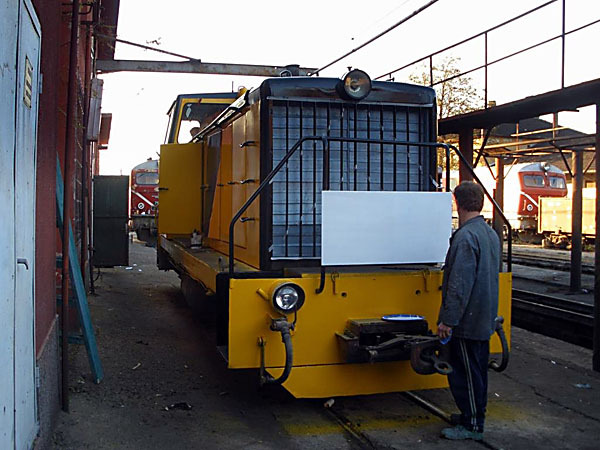 Finally, the newly-privatised railway invested in a modern road-railer shunting tractor, seen here in the workshops at Río Turbio. 1 Narrow Gauge Rails to Esquel, Keith Taylorson, with Plateway Press, 23 Hanover St., Brighton, UK, 1999, page 42. 2 Trenes magazine, October 1996, page 36. 3 The World of South American Steam, Roy Christian & Ken Mills, 1974, page 94. 5 The World of South American Steam, as above, page 94; and Fernando Carnero's webpage. Link currently (January 2011) unavailable. 6 The World's most Advanced Steam Locomotive, article by M. Swift and R. Wilkinson in The Narrow Gauge issue no. 82 The magazine of the Narrow Gauge railway Society. 7 Ferroclub newsletter No. 22, September 1996. 8 Trenes magazine, October 1996, page 36. 9 El Tren del Fin del Continente, a CD-ROM of photos collected by the Amigos del Ferrocarril in Río Gallegos. 2000. Edgardo F. Gallardo. E-mail him (in Spanish) at <tandem@ciudad.com.ar> for details. 9A Found on Facebook, Carmelo Haag (16/9/16, no longer available). 10 El Reportero Ferroviario, Edición 818, February 13th 2010. 11 Private communication from Veselin Malinov, and photos reproduced with his permission. 12 Photo provided by kind permission of Karl-Heinx Buchholtz of Bombardier Transportation, Kassel, Germany. 12A Found in Facebook, Jorge Ceregliano (15/8/16, no longer available). 13 Con corazón de carbón, by Sergio Garcia, a comprehensive study of the RFIRT in Todo Trenes magazine no 68, June 2009.